This wasn’t a healthy breakup. He’s pissed. But then you listen… and it sounds like the saddest thing you’ve ever heard. All of that anger is transformed into resignation by the gentle picking of Dylan’s acoustic guitar. This entry was posted in dylan weekends and tagged Bob Dylan, Don't Think Twice It's All Right, The Freewheelin' Bob Dylan. Because I read/hear the song that way, I found it the perfect an poignant choice to accompany Matt’s journey out of Dillon. It seems, however, like a very odd choice to accompany the discovery of a husband and father that his family has left him. Perhaps, the director liked the irony of a lyric suggesting the choice was made by the unencumbered man, when in reality it was made by the woman (and her children) who encumbered him. Regardless, it’s a wonderful song. Her interpretation does play up the anger you hear in the lyrics, so I guess the performance of the lyrics matters as much as the words themselves. 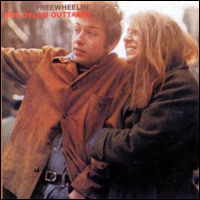 As I said yesterday, this is one of the better known classics from Freewheelin’ and it is a great one. I “kinda” agree with Amy that the lyrics are not so much angry as melancholy, and they fit the music quite well. As for Amy’s post, it’s nice to hear Koole covering Dylan, as her original songs, particularly those from her 2nd album, are clearly inspired by artists like Dylan.. I completely feel the “don’t think twice, it’s alright” line is ironic, as are many of the songs lyrics… “you just kinda wasted my precious time” isn’t him sharing the blame, it’s him being bitingly sarcastic. Of course, like the best songs, this one can be read in many ways. As for the TV shows, I don’t think the lyrics particularly apply to either situation… I believe the song was picked for its mood more than anything. Matt wouldn’t address this song to anybody he was leaving behind in Dillon. If anything, it might apply to the city itself.